Founded in 1995, CoreRFID has over 20 years experience in the technologies that support track, trace, audit and control applications. Find out more on our main web site or follow our Facebook page. While RFID is still a relatively new technology, CoreRFID has a track record in working successfully with the full range of devices, software and solutions used for track, trace, audit and control applications. This means CoreRFID can help you to make the best choices for your RFID or bar code system requirements. CoreRFID's customer base includes providing RFID technology, solutions and consultancy to organisations including Ainscough Crane Hire, BBC, Capita, Costain, Nokia, Thames Water and Norwich Union. In a field where new development makes new applications practical, CoreRFID keeps in touch with the latest advances and makes it easy for clients to get the benefit of them. CoreRFID has strategic partnerships with providers of Low Frequency, High Frequency and Ultra High Frequency components, making it possible for CoreRFID’s clients to exploit this technology. CoreRFID software solutions are developed using the Microsoft .Net Framework making it easy to integrate track, trace audit and control applications with other back office systems. Take a look at our CheckedOK system here. CoreRFID was formerly known as Mannings RFID. In July 2007 the current management team successfully completed a management buyout to create a business exclusively focused on the needs of RFID technology users. 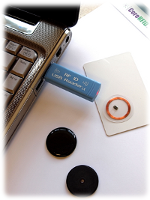 CoreRFID retains all the staff, know-how and intellectual property of the Mannings RFID business. The CoreRFID team of experienced engineers and its sales and administration centre is based in Skelmersdale, in the North West of England.